This is fascinating as a period piece of what progressive people had to deal with every day in the aftermath of the revolution in Iran. The scene where she has to frantically hide her Jane Fonda tapes and VCR reminded me of some stories from my spouse's childhood in Communist Romania. Maybe it's the times we're living in, but to me, this film was also pretty universal. Virtually every horror movie is really a dramatic exaggeration of a real fear. And in this case, that would seem to be that no matter how smart and good and forward-thinking you are, pernicious old-fashioned awfulness may still be able to destroy you and those you love. The djinn have it in for this family, yes, but so do the authorities, so does the landlord, so do some of the older neighbors. I love the way the movie slowly transforms, almost without you noticing it's happening, from a realistic period piece to a horror movie. A lot of haunting-subgenre horror movies struggle, to sometimes farcical levels, with the underlying problem of why these people are staying in that house. (Insert the classic old Eddie Murphy routine that inspired Get Out's title choice.) 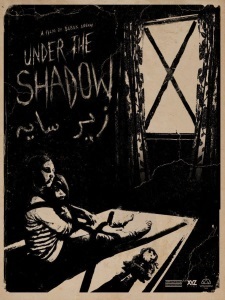 Under the Shadow doesn't struggle at all: she's horribly stuck because her environment is just as horrifying outside as the evil presence inside. One of the most effective moments for me was when they did get driven out, and immediately picked up by the authorities angrily yelling at her that they're doing her a one-time favor by not having her tortured for her terrible impropriety. No escape purely because of human terribleness.